The 3M Particulate Filter 2091, P100 has been developed with your respiratory needs in mind. Sold in pairs. Comfort. 3M’s Advanced Electret Media (AEM) provides a lightweight, easy breathing combination not found in fiberglass containing filters. Versatile protection. The 2091 is well suited for a wide range of oil and non-oil based particulate contaminants and can be used as a prefilter for certain chemical exposures. Simplicity. The versatility of this filter reduces your inventory and training requirements. Compatibility. The 2091 can be used with 3M’s wide variety of half and full facepiece designs. Exceptional filter efficiency. 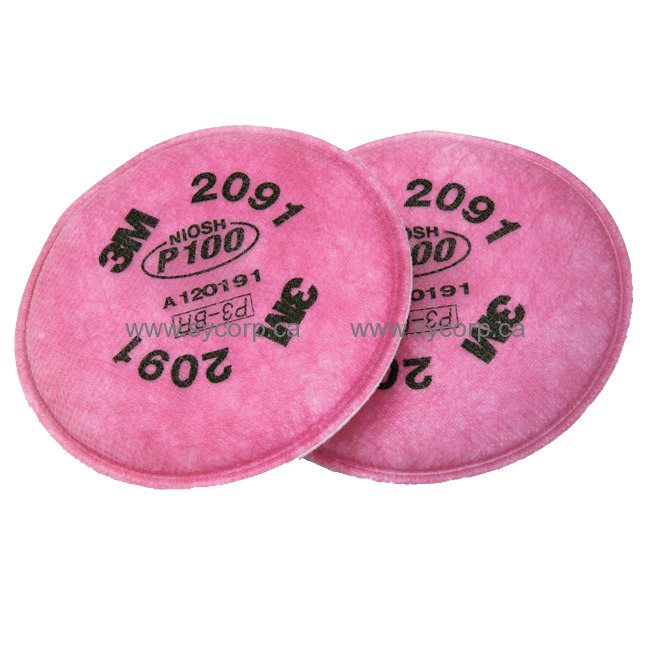 Passing NIOSH’s P-series test criteria, the 2091 P100 filter provides a minimum 99.97% filter efficiency. Durability. The unique flexible filter material resists abrasion and wetting. Filters are flame and water resistant. Economy. The 2091 is priced competitively with other filters in its class. Solids such as those from processing minerals, coal, iron ore, cotton, flour, and certain other substances. Liquid or oil based particles from sprays that do not also emit harmful vapors. Metal fumes produced from welding, brazing, cutting and other operations involving heating of metals. Radioactive particulate materials such as uranium and plutonium.